What a great, simple recipe! It was fun to roll and make! It has a very deep, gourmet flavoring. *Even though it says 4 boneless chicken breasts, I had to halve the breasts first because they were too thick. As you can see by the 2nd photo, it makes great and attractive leftovers. From “Frugal Foodie” cookbook. **If you use wine, it will not be IC safe. Use a safe chicken stock. Please also check prosciutto’s ingredients to be safe! On a cutting board, pound chicken breasts flat with a kitchen hammer. 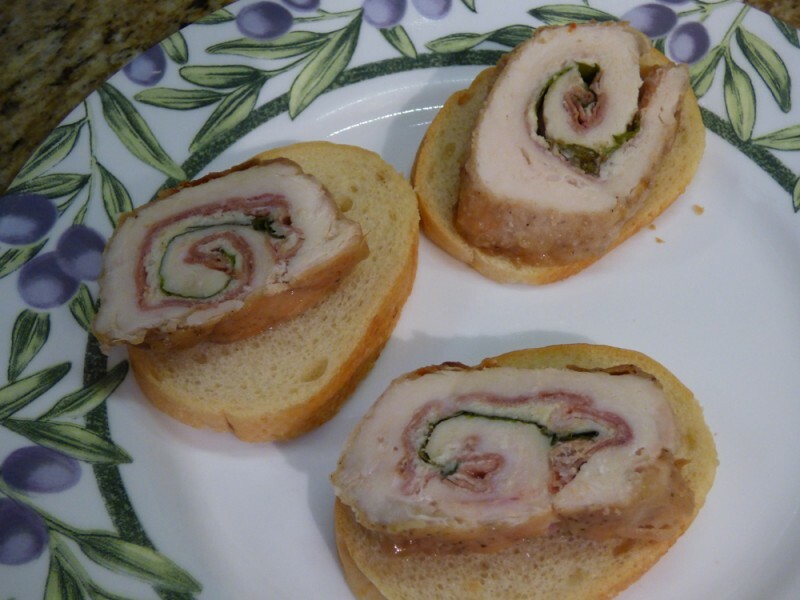 Place 1 slice prosciutto, 1 T. Parmesan, and 2 basil leaves on each breast. 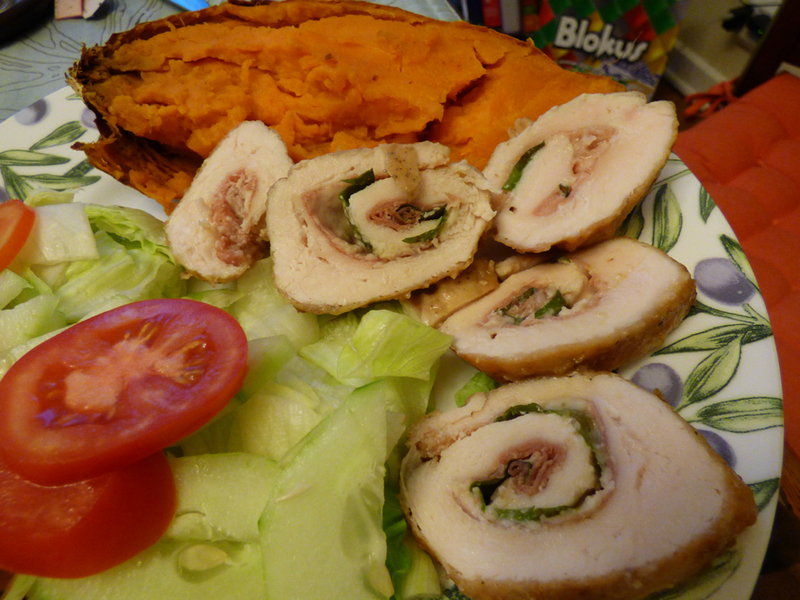 Roll up chicken breasts and secure with wooden toothpicks. Roll each breast through flour to lightly coat, season with salt. In a large pan heat olive oil and saute chicken over medium heat until golden brown on all sides. Add 1 cup wine/chicken stock to pan, cover and reduce heat. Simmer 15-20 mins, turning several times, until chicken is tender and cooked through. Remove from pan, increase heat and add remaining 1/2 cup of wine/chicken stock. Deglaze skillet and reduce liquid to form sauce. Season with salt, spoon over chicken, and serve. (I recommend letting it rest for 10 mins. though before serving). 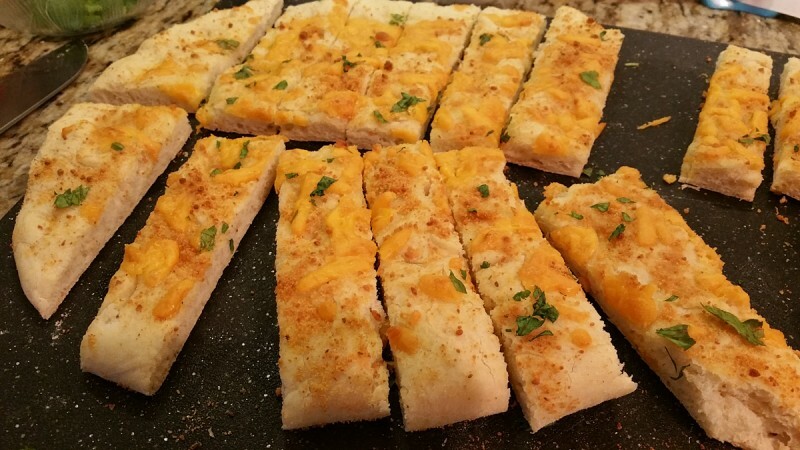 My family really enjoys this flatbread. It has wonderful flavors including garlic, cheese, Parmesan, butter and that great yeasty goodness. I’ve made it two years ago and am glad I made it again. 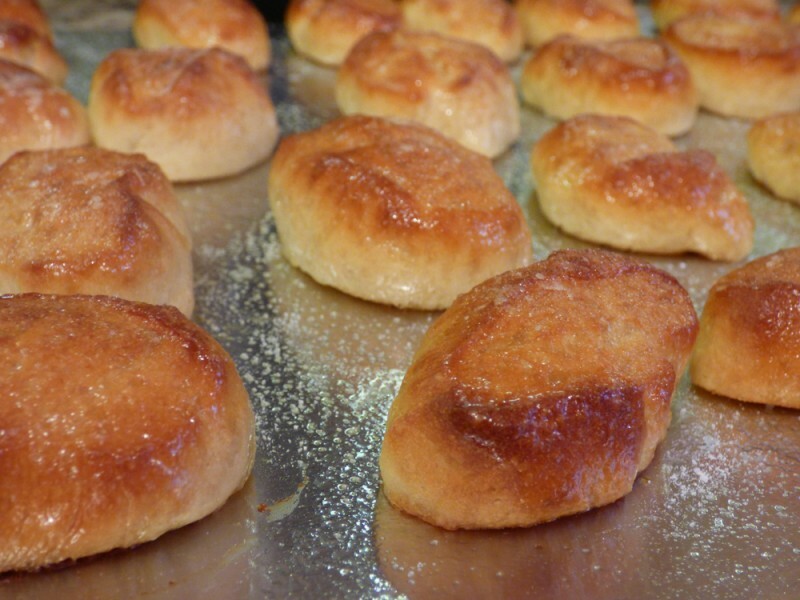 If the dough is too sticky, just add a few tablespoons more bread flour at a time and re-evaluate it. Only use bread flour for this one, it will turn out best. You can reduce the butter. I think 1/4 cup is too much (half of a stick). I’ve used 3T butter and gotten away with it just fine! **I added a little parsley for flavor and looks. Enjoy! P.S. – I go through so much active dry yeast, I buy it in the jar and keep it in the fridge. It works best for me and reduces packaging. I try to be Earth-friendly when possible! 1 (.25 ounce) envelope active dry yeast (A.K.A. 2 1/4 tsp. active dry yeast if dispensing from jar). 2-3 TBSP. butter, softened (I use unsalted butter because you are adding salt to the dough). *I always use 2 TBSP and it’s enough. 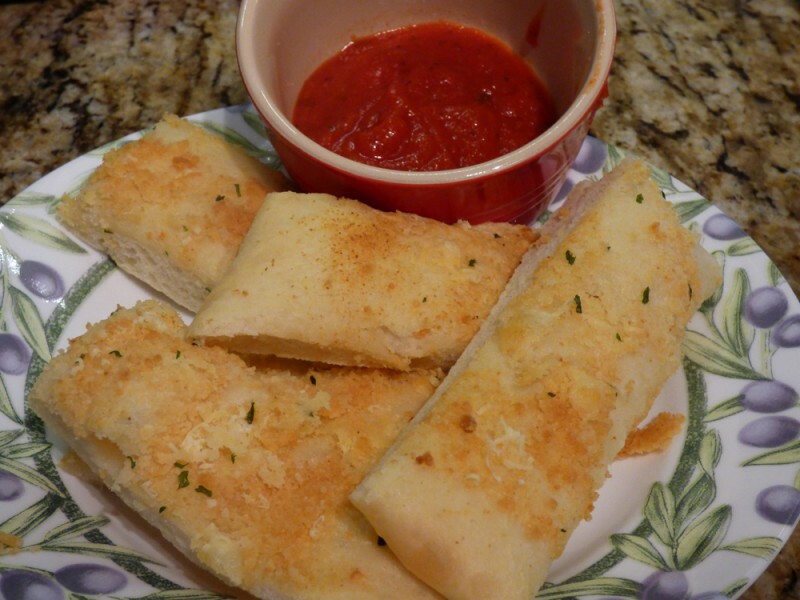 1/3 cup shredded mozzarella cheese, or more. We love this recipe! 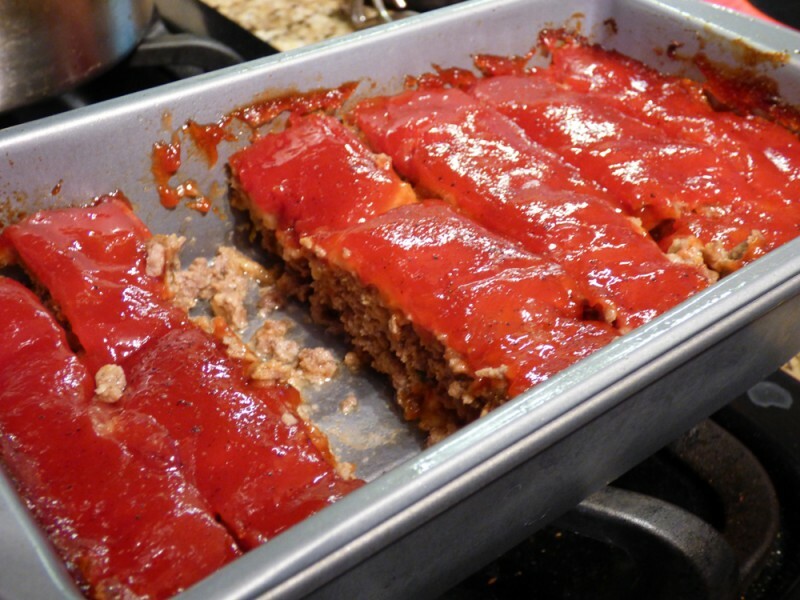 It delivers moist and tangy meatloaf that will make you and your guests want more! We used 1/2 and 1/2 and I used onion powder. I added 3 T. of brown sugar to the top. I used 90% lean ground beef. I used my meatloaf pan so that the meat doesn’t sit in all of the oil and juices. The meatloaf pan had about 1/4″ of fat and juices in the bottom. I highly recommend that pan! Enjoy! Spray loaf pan or meatloaf pan. Combine meat loaf ingredients and place into a loaf baking dish. The addition of 1 or 2 teaspoons of Kitchen Bouquet® makes this recipe very good. Recipe should be”plump” from the addition of the milk or Half & Half. It should NOT be runny. A second batch of sauce served hot is good to serve with the meatloaf. Read more about this recipe at Food.com. 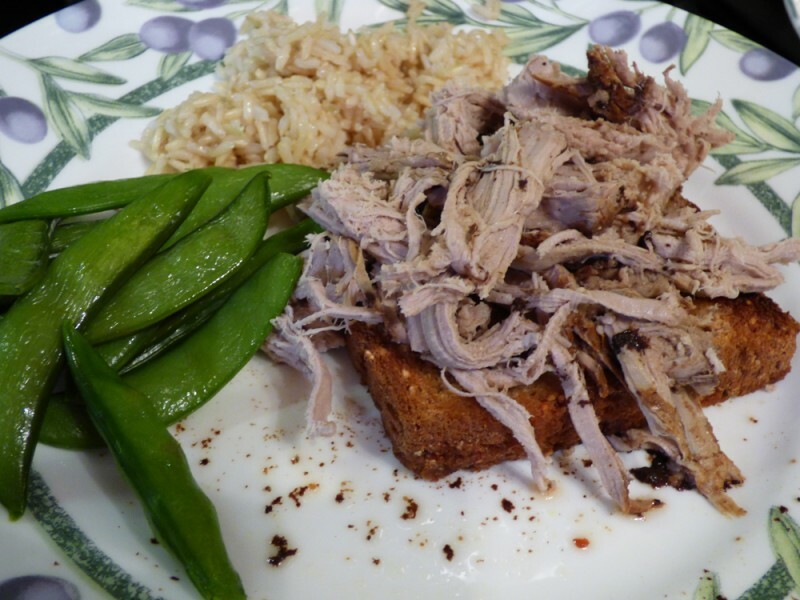 This is a fantastic recipe for slow cooker pork tenderloin marinated in balsamic vinegar plus other marinades and spices. It’s from the Add a Pinch website, link below. I loved the flavor and sauce! I really liked that it didn’t smell too “porky”, I’m sensitive to smells and they turn me off. I used garlic powder just fine. It took 5 minutes to prepare and was just a waiting game. On low it took about 4-4.5 hours. It was even easy to shred! YUM! 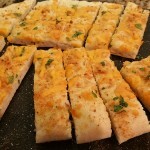 I got this great recipe from www.centercutcook.com. It’s everything I ever wanted from a pretzel and is best warm! Forget about the fancy shapes, this tastes so wonderful! I used only 2 Tablespoons butter and it was more than enough. Eat one quickly, they go fast! ENJOY….. In the bowl of your mixer, sift together flour, salt, sugar, and yeast. Add in 1 cup of very warm water and use the dough hook to mix it well. You could also do this by hand or use a food processor. Knead the dough until it is smooth. Sprinkle flour in the bottom of a bowl. Place the dough in the bowl and cover it. Allow it to sit for about 30 minutes to rise. After 30 minutes, knead the dough for 30 seconds to 1 minute. Divide the dough into 4 equal sections. Form each section into strips about 8 inches long and about 1 inch wide. Cut each strip into about 6-8 pieces. You should end up with 24-32 pretzel bites. In a shallow dish (I used a cake pan), combine the very hot water (I microwaved it for 2 minutes, you could also boil the water on the stovetop) with the baking soda and stir to dissolve. Place the pretzel bites in the water/baking soda mixture and allow to sit for one minute. Then flip the pretzel bites and allow to sit in the mixture for one minute longer. 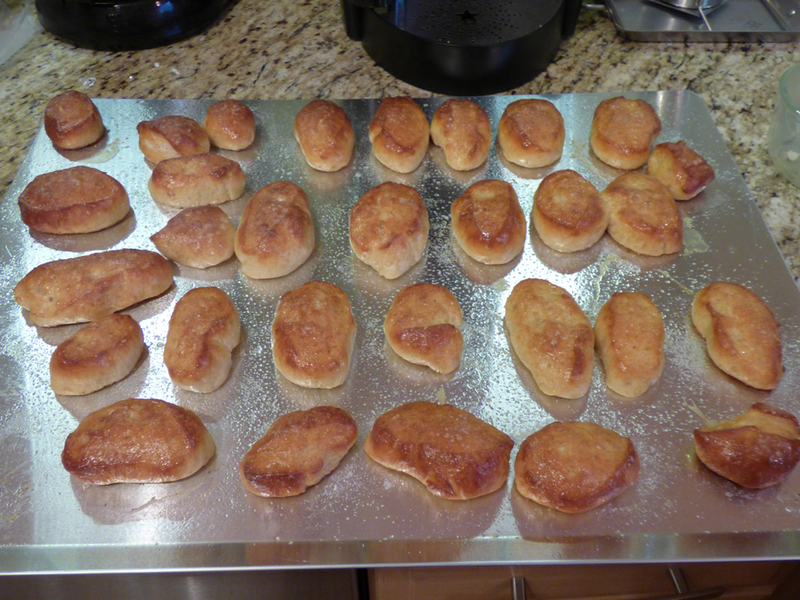 Arrange the pretzel bites on a greased baking sheet. Allow the pretzel bites to rest for about 5 minutes, then sprinkle with a bit of kosher or sea salt before baking them for 10-11 minutes, or until the pretzel bites are nice and brown! While the pretzel bites are baking, melt 3 tablespoons of butter (1 minute in the microwave). When the pretzel bites are done baking, immediately brush each bite with melted butter. Keep brushing the bites with butter until it is all gone. Serve with your favorite dip! 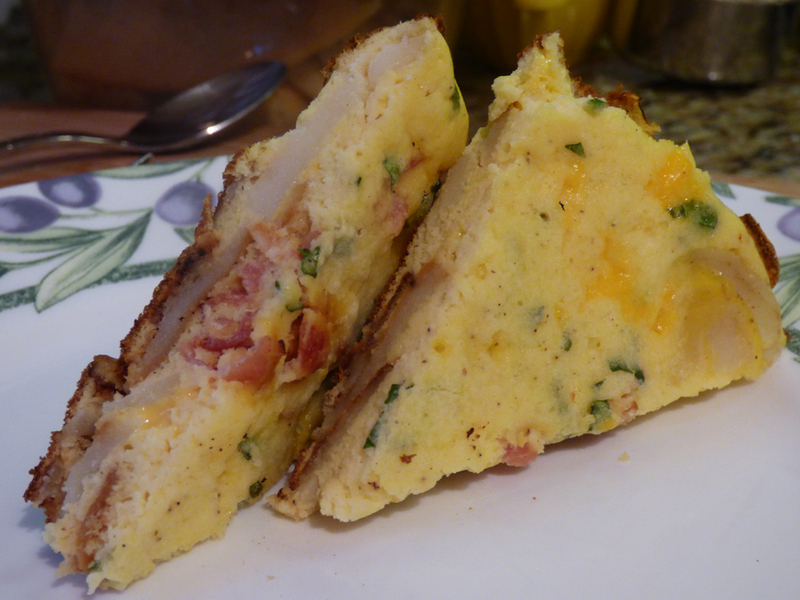 I’ve made omelets, eggs, and quiches before, but this was my first frittata. I used what I had on hand: bacon and potatoes. Next time I’ll try to add some bell pepper and other ingredients. It was pretty simple, you just have to make sure you do not burn your potatoes on the bottom layer. I omitted the green onion. I used fresh basil from the garden. 🙂 Enjoy! **Some people are irritated by onion, tread carefully! Using a large, nonstick skillet, cook bacon pieces until crisp. Reserve 2 T. of bacon drippings. Drain bacon pieces on paper towel. Add potato slices to skillet with reserved bacon drippings. Cover and cook over medium heat for 12 to 15 minutes until tender and lightly browned. Turn potato slices over and turn down heat to prevent over-browning (if necessary). In large bowl, beat eggs, milk, and salt until combined. Stir in cheese, green onion, and basil. Set aside. Spread cooked potatoes in an even layer over the bottom of skillet. Sprinkle the bacon over the potatoes. Cover, reduce heat to medium low. Cook 15 to 20 minutes until top surface of egg is set. 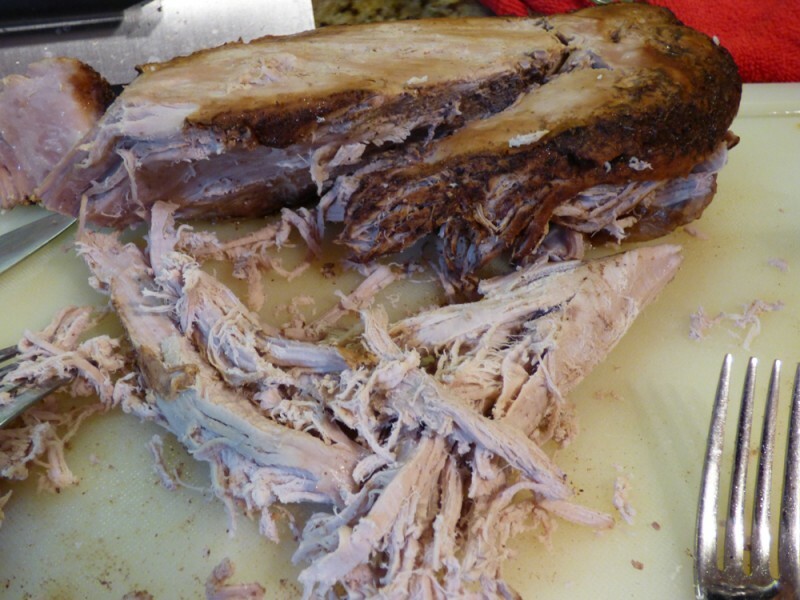 Decrease heat to low if necessary, to allow center to cook without over-cooking the edges. Loosen edges of frittata from pan, carefully invert onto large serving plate. Put a dollop of sour cream or salsa on top right before serving, if desired. I like this recipe because it is so fast, simple, and tastes like an elephant ear without being deep fat fried! Or, if you’re very picky, it tastes similar to an elephant ear from the fair! That amount of sugar and cinnamon mixture yielded us about 3-4 tortilla toppings, but it will depend on how much topping you like. 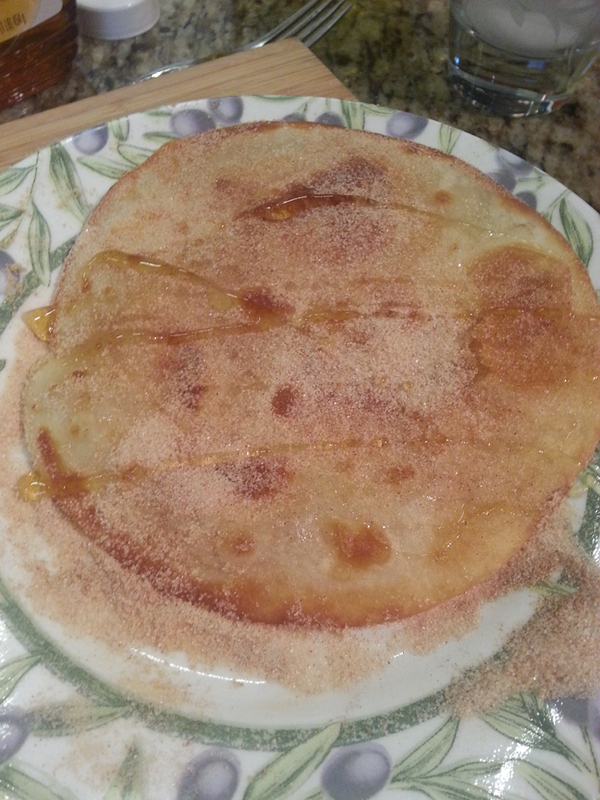 I like to brush on a little honey to keep the sugar/cinnamon mixture sticking to the tortilla. You want a fairly medium to high heat here to make the tortilla puff up a little and brown, otherwise it just tastes like a regular tortilla! **Known IC irritants, tread carefully! To make this IC safe remove the awesome cinnamon. I know, I’m sorry! Combine sugar and cinnamon in a shallow bowl or large plate, set aside. In a skillet, heat some vegetable oil. Place one tortilla at a time in skillet. Cook for 5 seconds or until brown in spots on one side. Turn and cook 10 seconds longer, or until browned on the other side. Brush with honey if desired. Place in sugar mixture and turn to coat.